Have you ever talked to a dog. Not just the "Who's a good boy? Spike's a good boy" stuff, but really talked? About your struggles, your heartaches, your joys—baring your soul to a canine friend? If you have, chances are it made you feel free to say whatever you wanted, without the burden of justifying your position, sounding witty, or telling an entertaining story. Free to take your time, without fear of judgment or recrimination. Even if you can't have a real discussion, when compared to conversations with humans you'd probably admit that dogs are the better communicators—paws down. Why? Because even though they don't speak our language, they really listen. It's time to take a fresh look at listening and we need go no further than the furry best friend at our feet. Dogs don't interrupt us, finish our sentences, offer advice, try to top our stories, or text us instead of talking to us. Dogs pay extremely close attention to us; they study our facial expressions, our body language, our eye movements, and our voice patterns. Dogs do not just listen with their ears, they listen with their entire being. True listening can enhance every relationship in one's life, and can transform broken associations and inject new life into business and social interactions. It is the magic ingredient that forges real connections with others. People want good listeners in their inner circle, they want do business with them, they trust them and will share critical information with them. That means the person who masters this skill has enormous advantages, both in business and in his or her personal life. 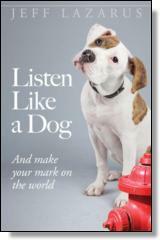 By listening like a dog, readers will find renewed connection and a deeper sense of compassion, companionship and understanding with the people in their lives. Have you ever talked to a dog? Not just the 'Who's a good boy? Spike's a good boy' stuff, but really talked? About your struggles, your heartaches, your joys? Have you ever thrown self-consciousness to the wind and bared your soul to a canine friend? If not, you might want to try it. No appointment necessary, no co-pay required. Well, maybe a walk or a treat . . . If you have talked to a dog this way, how did it make you feel? You probably felt free. Free to say whatever you wanted to say, without the burden of making logical sense, justifying your position, or having to tell an entertaining story. Free to feel whatever you needed to feel. You probably felt unrushed. As if you had all the time in the world to speak your piece—and your listener wasn't checking his watch or cell phone and edging toward the door. No doubt you felt accepted and un-judged. You could have confessed to a triple homicide and your listener wouldn't have held it against you. Odds are you felt supported, as if your listener was on your side. You felt positive, compassionate energy coming your way. You probably felt as if you were the center of another being's world, the most important thing in that being's life, at least at that moment. You almost certainly felt a connection with that being: a life-to-life connection uncomplicated by abstract concepts, such as credit card bills or dinner plans or the fight you had last night. Most of all, you felt heard. Received. Taken in. Though your listener may not have understood the words you were literally saying, he heard you—the person behind the words and feelings. And so you felt complete in your communication. When was the last time you felt that way talking to a fellow human being? When was the last time someone felt that way after talking to you? Couldn't the world use a little more of this kind of listening? A lot more? Real Connection: Where Did It Go? We live in the Era of Connectivity—or so we're told. Over the past few decades, trillions of technology dollars have been invested in developing cool new ways for humans to connect with one another. With each new connectivity platform that emerges—cell phones, chat rooms, e-mail, voicemail, instant messaging, texting, Skype, Facebook, Twitter, online gaming, etc.—the community of mankind grows closer to us. Our cell phone and e-mail contacts often number in the hundreds, and many of us have hundreds, or even thousands, of LinkedIn connections, Facebook friends, and/or Twitter followers. We hold the world, almost literally, in the palm of our hands. How unbelievably awesome! Well . . . maybe . . . So how are we using all this new technology? Do we suddenly have more meaningful things to say to one another? Are we breaking new ground in our personal and business relationships? Have we deepened our connection to humanity at large? Do we have more intimate friends? Um . . . well . . .
A recent study reported by ABC News revealed that we actually have fewer real friends than we did before the social networking boom:(1) a full one-third fewer, to be precise, since 1985. Friendship, for the purposes of the study, was defined simply as someone you could talk to about 'important matters.' Think about that. Our ability to confide in one another—to be honest, direct, open, and real—is shrinking. With all the connectivity at our fingertips, we don't have more true communion with our fellow beings, we have less. What's going on here? There has been an unprecedented explosion in our number of connection points, yet a drastic reduction of real connections. We have superficial, trivialized connections with more and more people, but deep, real connections with fewer and fewer. Face it: when you realize that the three orcs in your raiding party in World of Warcraft are your most intimate friends, it's time to admit that something has gone off the rails. This quantity-over-quality sellout does not affect only our personal lives, it affects our business lives as well. It has long been known that personal connections are the key ingredient that sells products, brings teams together, and tips the decision-making scales one way or another. Those old-timey Death of a Salesman guys who spent half their lives on the road, visiting customers and taking them out for dinner and drinks, might have known a thing or two. That is, people do business with people they like and feel connected to. The same is true with hiring decisions. It's well known that employers often hire the people they like. We want to work with people with whom we feel a connection. That basic fact hasn't changed in the digital era. And yet we all seem to be drinking the Kool-Aid of superficiality. We point proudly at our bloated 'friends' lists, but many of us have no one to call when we need a real friend. Instead, we post our woes on Facebook, looking for comfort. Humans are a social species. That's just the way we're wired. Connections with other living beings are what feed us, sustain us, validate us, and bring us joy, comfort, and meaning. Multiple studies demonstrate that those who are cut off from others, either physically or emotionally, suffer more depression and other psychological disorders, get sick more often and for longer periods, and die younger than those who have thriving, meaningful connections. (2) Conversely, people with vibrant human connections are mentally and physically healthier and live longer. And the quality of their lives is reportedly much higher. The ability to connect with other people in our personal and professional lives comes down to one essential skill. Oddly enough, it's the one skill I see lacking in a large percentage of business interactions I've witnessed, as well as most personal interactions. It's this: the willingness and ability to listen. Salespeople talk up their products, but don't listen to what their customers really need. Politicians boast about their records, but don't ask what their constituents are looking for in a leader. Parents blame teachers for a child's bad grades, but don't ask what their son or daughter could do differently. Facebook devotees often blare their opinions on their page, but don't ask if you care or might be offended. There's a serious lack of ability to switch gears from output mode to input mode. Most of us modern humans have our stick shift jammed in 'output.' We may know how to physically shut our mouths (every now and then), but we haven't developed the internal spaciousness to listen. Our inner cup runneth over with our own content. And we're the ones who are suffering. ©2016 Jeff Lazarus.All rights reserved. Reprinted from Listen Like a Dog: And Make Your Mark on the World. No part of this publication may be reproduced, stored in a retrieval system or transmitted in any form or by any means, without the written permission of the publisher. Publisher: Health Communications, Inc., 3201 SW 15th Street, Deerfield Beach, FL 33442. Jeff Lazarus has enjoyed a career spanning more than two decades with one of the world's leading pharmaceutical companies. He is a Health Science Consultant, serving as a scientific liaison to physicians, academicians, and health educators. As a five-time recipient of the Vice President's Award, he has earned "Hall of Fame" status. Jeff has a BA in speech communication, with an emphasis in interpersonal and organizational communication, from Cal State University, Long Beach, and an MBA from Pepperdine University. He has taught public speaking at the university level and conducted numerous workshops on listening, presentation skills, and customer engagement. His love for dogs is portrayed in the 2015 release, Dogtology, a whimsical exploration of humankind's fanatical devotion to dogs. Jeff grew up acting in theater, and is an avid music fan who plays guitar. As a major sports enthusiast and knowledgeable fan, he has coached championship-winning youth sports teams in baseball and soccer.